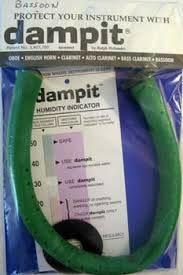 Dampit is designed to fit inside your instrument, where it slowly releases moisture to create the proper humidity. Regular use of Dampit will protect your instrument from crackign and keep the pads from drying out. If you have any questions about this product by Dampit, contact us by completing and submitting the form below. If you are looking for a specif part number, please include it with your message.